There is some minor foundation jacking to be done on this house. Really only one low spot that I can see, and it’s easily accessible (the house is nearly 4′ off the ground and easy to get under) so it should be no big problem, but even minor jacking work can be really expensive to have done. Since I’ve done it, I know what it takes and how to proceed. It’s not complicated, especially now that we have laser levels. Mainly it requires the willingness to crawl under the place in the first place. 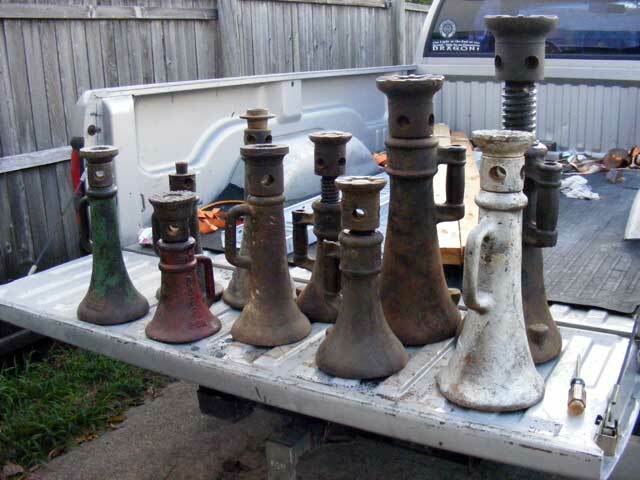 Those are screw jacks…sometimes known as “railroad jacks” or “house jacks”. Folks that know what they are, or have used them, know that when they come out, that somewhere, sometime, there is a heap of work to be done. The capacity is based on the screw size. The smallest is 1-1/4″, which is good for about 15 tons. The 2″ are good for 20 tons, and the big ones in the back are 2-1/2″ and good for over 30 tons. The jacks themselves weigh anywhere from 30 pounds for the smallest to 80 pounds or so for each of the two biggest ones. Altogether they weigh something near 400 pounds. Screw jacks are desired over hydraulic jacks for this task. Most hydraulic jacks bleed down or lose height fairly rapidly with large loads. The ones that do not, are expensive. When it comes to jacks, more is better. Houses are heavy, and if you only have one or two, you can only lift a tiny bit before you have to stop, shim up your work, and relocate the jacks. Placing a large number of them about the area you need to adjust is the easiest and fastest way to get the job done. Ebay can be your friend in this case. I paid less than $20 for most of these, with that much again for shipping, and that’s a bargain. New they run $250-$350 each for the midsized ones. A couple have problems, but were included with the sale of good ones so were essentially free. There’s enough jacks there to pick up over 400,000 pounds…nearly half-a-million pounds.